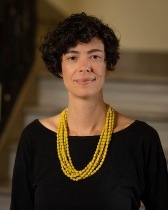 Lydia Barnett (Ph.D., Stanford University, 2011) is a historian of early modern Europe whose work explores the intersections of science, religion, and the environment in transnational contexts. Her current book project, provisionally titled Imagined Disasters: Thinking Globally in the Early Enlightenment (under contract with Johns Hopkins University Press), explores the scientific imagination of global natural disasters at the turn of the eighteenth century. As European commerce, religion, and empire increasingly extended their reach across the globe, and as networks of exchange allowed books, letters, bodies, capital, and natural resources to flow across ever greater distances, a multi-disciplinary new field of science and scholarship emerged which sought to describe the earth and its history on a global scale. The field focused in particular on Noah’s Flood, whose global reach served as a figure for the spread of Christian faith and empire and also grounded a new research agenda which called for the contributions of a far-flung network of scholars, since it had left its traces everywhere. During its brief heyday in the early Enlightenment, the genre of world disaster history built fragile bridges across religious and national divides in Europe while laying the groundwork for more lasting justifications of European dominance over the rest of the world. Many of these same questions about environment, knowledge, and power animate her second book project, tentatively titled The Work of Science. This book examines the rhetorical strategies that were used to represent and also to obscure different kinds of knowledge-work in the long eighteenth century. Specifically, it seeks to contextualize the growing value of knowledge derived from emplacement in local natural environments within the labor and environmental politics of the 18th century Atlantic World. At the undergraduate level, she will offer survey courses in European history and the history of science and medicine as well as upper-level courses on more specialized topics such as gender and science, the Enlightenment, natural disasters, and environment and empire. She welcomes applications from potential graduate students in early modern European and Atlantic World history, particularly those with interests in Italy, Britain, the Republic of Letters, and other transnational networks. She would likewise welcome applications from students with thematic interests in the Anthropocene, natural disasters, climate change, land and labor, and other topics that engage the intersection of science, society, and environment. She has received funding from the National Science Foundation, the Woodrow Wilson National Fellowship Foundation, the Gladys Krieble Delmas Foundation, and the Charlotte W. Newcombe Foundation. From 2011-2013, she was a Fellow in the University of Michigan’s Society of Fellows. In the fall of 2016, she will hold a visiting fellowship at the Max Planck Institute for the History of Science in Berlin.